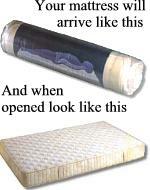 This is a range of mattresses in European or Euro sizes. They will fit beds sourced from Europe and also some Ikea and Habitat models, also service personnel returning from overseas postings often have these size beds. Before ordering any of these mattreses please be extra careful about measuring the bed they are to fit as once they are unrolled we cannot accept them back because you have measured incorrectly. Some the sizes we do carry in stock but if not in stock delivery is around 6 to 10 days. A key feature of a memory foam mattress is the fact more of your body is in contact with the sleep surface which means the body weight is dispersed over a greater area compared to conventional mattresses and therefore significant levels of enhanced pressure relief are achieved which greatly enhance sleep. This increase in contact area will naturally result in a warmer sleep, which is a welcome characteristic of memory foam in winter months but may not be appreciated in summer or by individuals who may suffer excessive sleep perspiration. The Memtec Combi-Air has been engineered to allow for a more cooler and dryer sleep experience. It achieves this in two stages; firstly by incorporating a three dimensional, air channelling, corrugation design to the top surface of the memory foam and secondly by incorporating the 3D -`Spacer` fabric in its cover. This combination allows for air to flow more freely around the body resulting in a cooler sleep without compromising any pressure relieving characteristics. The `Spacer` is a three- dimensional fabric which, apart from allowing air to flow through it also retains moisture which is gradually dispersed through evaporation resulting in a much `dryer` sleeping experience. · Unique combination of visco-elatic and LayTech foam technology. · Provide the ultimate in sleep comfort and support. · More `bounce` than conventional memory foam mattresses. 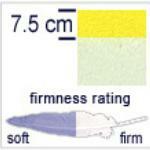 · Reacts to body heat and moulds to individual body shape. · Promotes good blood circulation. · Luxury `Double-Box` Quilted dry-cleanable zip off cover. · Complies fully with UK fire regulations. · 3D `air-flow` corrugation profiling to top surface. 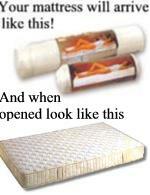 · Promotes improved airflow circulation around body for cooler sleep. · Relief for people with excessive sleep perspiration. · 6cm High density memory foam layer with 3D air-flow corrugation profile sculpted on top foam surface. Laytech is an advanced polyurethane foam developed by Kay- Metzeler which offers an unbeatable combination of exceptional comfort and support along with a luxurious feel and re-bound characteristics comparable to Latex. Luxury Quilted dry-cleanable zip-off cover. Complies fully with UK flammability regualtions. # Complies full with UK fire regulations. Waterlattex is the luxurious comfort solution from Relaxsan, for people who want to spend a little more and enjoy enhanced comfort and a deeper sleep. It is the result of research and collaboration among expert orthopaedists and technicians. This product offers maximum comfort and ensures the correct position of the spinal column whatever the body weight. 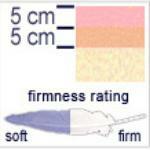 Standard 17cm thick, Deluxe These measurements are approximate. Please read delivery details to your left before ordering. EUROPEAN SINGLE size and approx 3" longer than a british single. This size does fit some electric beds as well. EUROPEAN SINGLE size and approx 3" longer and wider than a british single. This size does fit some electric beds as well.